1 Remove self-locking nut (1), two flat washers (2), hexagon head capscrew (3), and travel lock bracket (4) from travel lock bracket assembly (5). Discard self-locking nut (1). 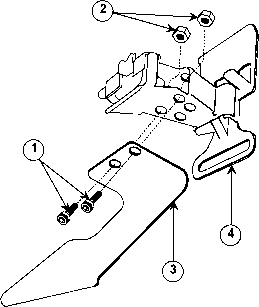 2 Remove two machine bolts (6), two lockwashers (7), and separate travel lock bracket assembly (5) into two halves (8). Discard two lockwashers (7). 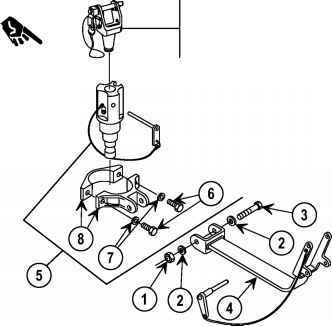 3 Remove quick release pin (9) from cable assembly (10). 4 Separate cable assembly (10) from retaining ring (11). 5 Remove retaining ring (11) from travel lock bracket (4). Items 12-18 apply only when mounting an M60 and are located in the Additional Authorization List (AAL), appendix F.
6 Remove two retaining clips (12) and headless grooved pin (13) and separate sleeve spacer (14), and travel lock adapter assembly (15) from travel lock bracket (4). Discard retaining clips (12). 7 Separate stud plunger (16) and compression helical spring (17) from travel lock adapter assembly (15). 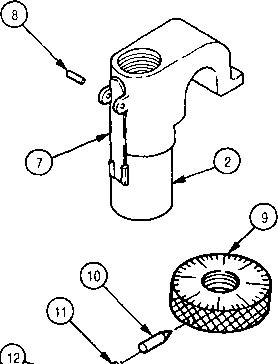 8 For disassembly of mount pintle (PN 11010408) (18) refer to paragraph 6-3. 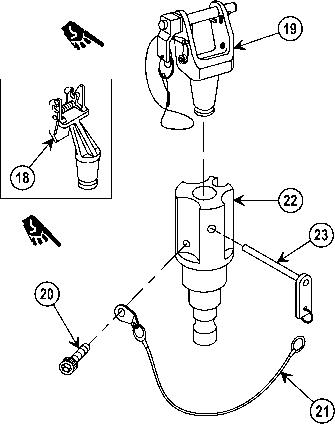 For disassembly of mount pintle (PN 12986102) (19) refer to paragraph 16-1A. 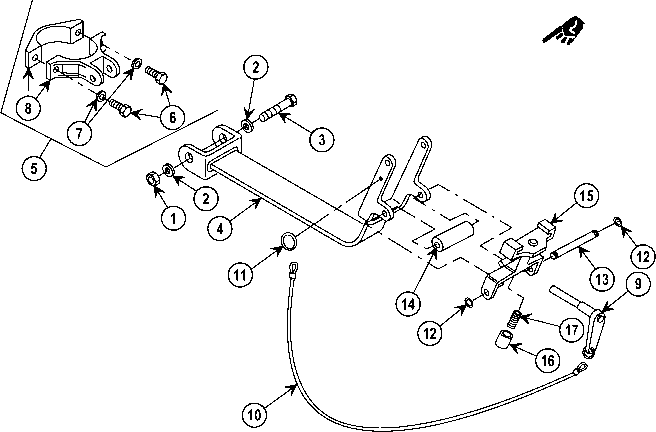 9 Remove socket head capscrew (20) and wire rope assembly (21) from pintle adapter (22). 10 Remove quick release pin (23) from wire rope assembly (21). 2 If travel lock bracket assembly is broken or damaged, repair is by replacement of next higher assembly. 3 If pintle adapter is broken or damaged, repair is by replacement of next higher assembly. 4 For inspection and repair of mount pintle (18) refer to paragraph 6-3 and for mount pintle (19) refer to paragraph 16-1A. 5 If travel lock assembly is broken, bent or damaged, repair is by replacement of next higher assembly. 6 Repair is by replacement of authorized parts (appx C). 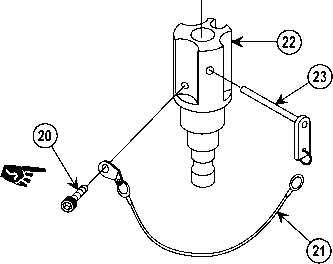 1 Attach quick release pin (23) to wire rope assembly (21). 2 Install wire rope assembly (21) on pintle adapter (22) using socket head capscrew (20). 3 For reassembly of mount pintle (18) refer to paragraph 6-3. For reassembly of mount pintle (19) refer to paragraph 16-1A. 4 Install compression helical spring (17) and stud plunger (16) in travel lock adapter assembly (15). 5 Assemble travel lock adapter assembly (15), sleeve spacer (14), and headless grooved pin (13) into clevis of travel lock bracket (4) and secure with two new retaining clips (12). 6 Attach retaining ring (11) to travel lock bracket (4). 7 Attach cable assembly (10) to retaining ring (11). 8 Attach quick release pin (9) to cable assembly (10). 9 Assemble two halves (8) of travel lock bracket assembly (5) using two new lockwashers (7) and two machine bolts (6). 10 Assemble travel lock bracket assembly (5) to travel lock bracket (4) using two flat washers (2), hexagon head capscrew (3), and new self-locking nut (1). 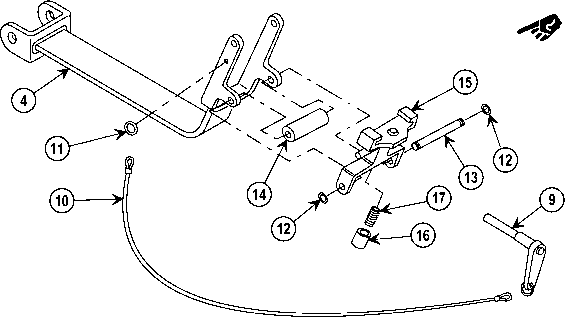 Remove capscrew (1), cable assembly (2), and quick release pin (3) from pintle assembly (4). 2 If pintle (4) is broken or damaged, repair is by replacement of next higher assembly. 3 Repair is by replacement of authorized parts (appx C). 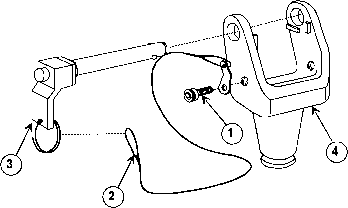 Install quick release pin (3), cable assembly (2), and cap screw (1) to pintle assembly (4). For additional maintenance of Ammo Adapter Bracket Assembly and Deflector, refer to TM 9-1005-313-23&P. 1 Inspect for broken or damaged parts. How big is the machine gun ring for the hmmwv? How to take m240 pintle apart?